Litigation funding is an increasingly common feature of commercial dispute resolution. Key players in the funding market are building global capacity and diversifying the range of matters and jurisdictions in which they invest, and it is increasingly common for funded actions relating to the same subject matter to be commenced in multiple jurisdictions or for multiple funded actions to be commenced in a single jurisdiction. Australia has long been on the frontline of legal and commercial developments in this regard. Here, Damian Grave and Helen Mould provide a snapshot of the current global funding landscape and identify some key trends that are likely to see funders continue to increase their involvement in international litigation and arbitration. The litigation funding market in the UK has grown rapidly and deeply in recent years, as courts have increasingly accepted funding arrangements as promoting access to justice, and following the endorsement given by Lord Justice Jackson in his 2009 review of civil litigation costs. Early last year, it was reported that funders’ investments in UK litigation had risen more than 25% in 2016, from £575 million to £723 million. Most major funders active in the UK have significant involvement in also funding offshore claims, as well as funding international arbitration cases, including investor state dispute settlement claims. Several recent or current large group actions in the English courts have been financed, at least in part, by funders (for example, the shareholder claims against RBS, Lloyds and Tesco, litigation regarding automotive emissions testing and claims against Mastercard in relation to fees). A key reason for the substantial growth of the litigation funding industry in Australia in the last decade has been its development in parallel with the Australian class action regime. In a pivotal 2006 decision, the Australian High Court ruled that commercial funding arrangements were not contrary to public policy. Subsequently, acceptance by Australian courts of “closed class” proceedings (where class membership is restricted to signed-up claimants), and more recently, the approval of the “common fund” doctrine (permitting funders to recover a commission across the “open class”) have enhanced funders’ returns. Empirical research confirms that class actions have been commenced in Australia with much greater frequency in recent years. Data published in 2016 indicated that approximately 40% of the total number of actions filed since commencement of the regime in 1992 had been commenced in the 6 years to 2016. In the period 2010-2016, 49.5% of Australian class actions were funded by commercial litigation funders, up from 23.4% in the 6 years prior. An increasing number of Australian class actions are backed by off-shore funders, and Australian based funders are increasingly pursuing opportunities in overseas markets. In June 2017, the Hong Kong Legislative Council enacted legislation expressly approving use of third party funding in arbitration. The legislation implemented recommendations of the Hong Kong Law Reform Commission. The Commission’s report concluded that the reforms were necessary to enhance Hong Kong's competitive position as an international arbitration centre and to avoid the loss of arbitrations to other seats where funding was permitted. A similar rationale was advanced for Singapore’s introduction, also in 2017, of legislation permitting third party funding for international arbitration cases and related court and mediation proceedings, including those for, or in connection with, the enforcement of arbitral awards. The internationalisation of commercial litigation funding is apparent from the footprint of some of the major players in the area. IMF Bentham Limited is an Australian funder which listed in 2001 and badges itself as “a pioneer of the global litigation funding industry”. IMF has offices in Australia, Asia, North America and Europe. IMF has recently stated that its funded cases under management have a total value in excess of $3.7 billion. 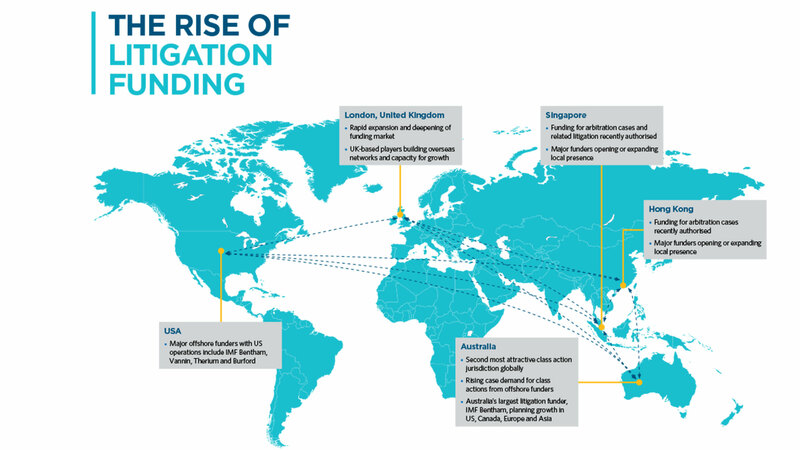 In addition to litigation in Australia, the United States, Canada and Singapore, IMF is funding (or has funded), cases in New Zealand, Hong Kong, the UK, Netherlands and South Africa. Harbour Litigation Funding is based in the UK and operates globally with offices in London, Hong Kong and Singapore. It states that it has funded cases in 13 jurisdictions and under 4 sets of arbitral rules, and has raised capital of £760 million. International Litigation Funding Partners is a Singaporean based funder that has funded several large Australian securities class actions. Vannin Capital is a UK based funder, with offices in Europe, Australia and the United States. Therium is a UK based funder with offices in Europe and New York, established in 2009, which states that it is funding $36 billion in claims. Burford Capital Limited is an LSE-listed funder, with offices in New York, London, Chicago and Singapore. Burford has stated that its volume of new business in FY17 ($1.34 billion) was more than triple the level in FY16 and more than 30 times the level in FY13. Augusta Ventures Limited, is a UK based funder, which badges itself as the largest litigation funder in the UK by volume of claims financed. In 2017, Augusta opened a Sydney office. Litigation funding is becoming accepted and used in an increasing number of jurisdictions. Funders are increasingly building global capacity and diversifying the range of jurisdictions in which they invest, as a growth strategy and in order to mitigate risk. Competition for new investment opportunities within the global litigation funding market is intensifying. Funders are supporting a broader range of disputes than previously. It is increasingly common for funded actions relating to the same subject matter to be commenced in multiple jurisdictions, giving rise to the challenges of parallel litigation and competing claims. Helen is an Executive Counsel, specialising in commercial litigation.